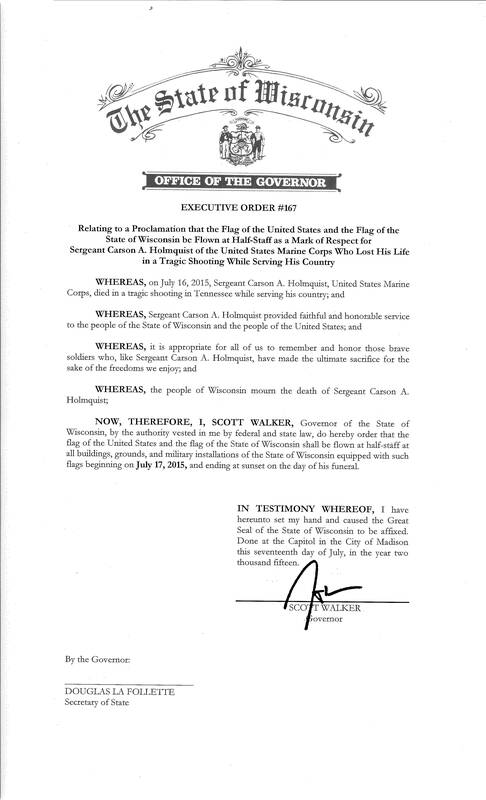 Madison – Governor Scott Walker today ordered flags lowered in honor of Marine Sergeant A. Carson Holmquist, a Wisconsin native killed in a shooting at an operational support center operated by the U.S. Navy in Chattanooga, TN. Sgt. Carson A. Holmquist was an active duty Marine who served a deployment in Afghanistan. A native of Polk, Wisconsin, he entered active duty in January, 2009. Montreal, Canada – Governor Scott Walker and officials with the Wisconsin Economic Development Corporation (WEDC) met today with dozens of Canadian business executives to make the case for why their companies should consider establishing or expanding operations in Wisconsin. Governor Walker and WEDC leaders held several one-on-one meetings with individual companies in targeted industries in Montreal and also co-hosted a Wisconsin reception with the American Chamber of Commerce in Canada. During the evening reception, Governor Walker and WEDC officials had the opportunity to personally engage with executives of Canadian companies that have expressed an interest in Wisconsin or expansion plans in unidentified locations. Among the companies that Governor Walker and the Wisconsin delegation met with earlier Tuesday was Agropur Cooperative, a leading North American dairy processor that has four facilities and more than 800 employees in Wisconsin. Agropur has completed an investment project of more than $110 million at its Luxemburg plant and is currently investing $55 million at its facility in Weyauwega. At Tuesday’s meeting with company CEO Robert Coallier and U.S. Division President Doug Simon, Governor Walker received an update on those plans and also discussed how Wisconsin could assist the cooperative with future jobs and business operations expansion. “Wisconsin, which is a leading state in dairy, represents a key region in our strategy and our recent investments there will allow us to accelerate our growth,” Coallier said. Governor Walker also met with company officials at Domtar Inc., which has a Canadian corporate office and two paper mills in Wisconsin – in Nekoosa and Rothschild – that employ nearly 900 people. At that meeting with Senior Vice President of Corporate Development Patrick Loulou and other top executives, Governor Walker learned more about the company’s current Wisconsin operations and future business plans. The meetings are part of Governor Walker’s business development mission to Canada that wraps up on Wednesday. The mission is focused on encouraging Canadian companies to consider establishing operations in Wisconsin or increasing their presence in the state. Joining Governor Walker on the trip are Katy Sinnott, vice president of International Business Development for WEDC, and Kristie Pulvermacher, WEDC’s business attraction and foreign direct investment manager. 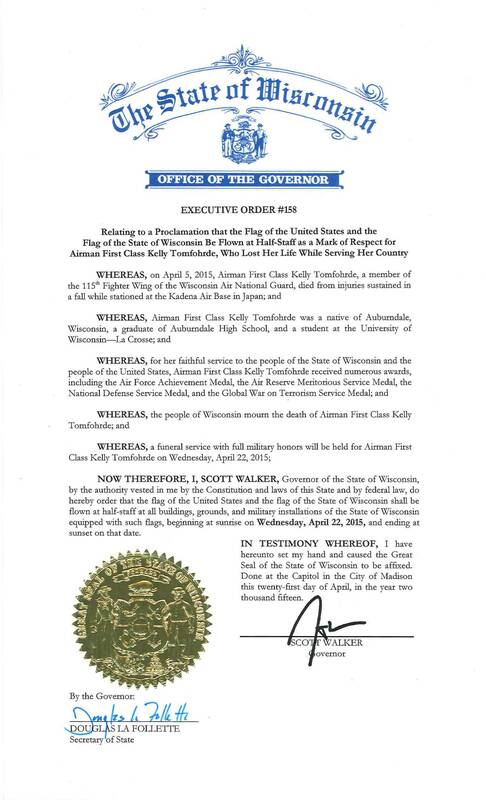 Governor Scott Walker today signed Executive Order #158, ordering flags flown at half-staff tomorrow as a mark of respect for Airman First Class Kelly Tomfohrde, who died while stationed at the Kadena Air Base in Japan. Tomfohrde, a member of the 115th Fighter Wing of the Wisconsin Air National Guard, was a native of Auburndale, and attended the University of Wisconsin-La Crosse. She died April 5, 2015 from injuries sustained in a fall in Japan. 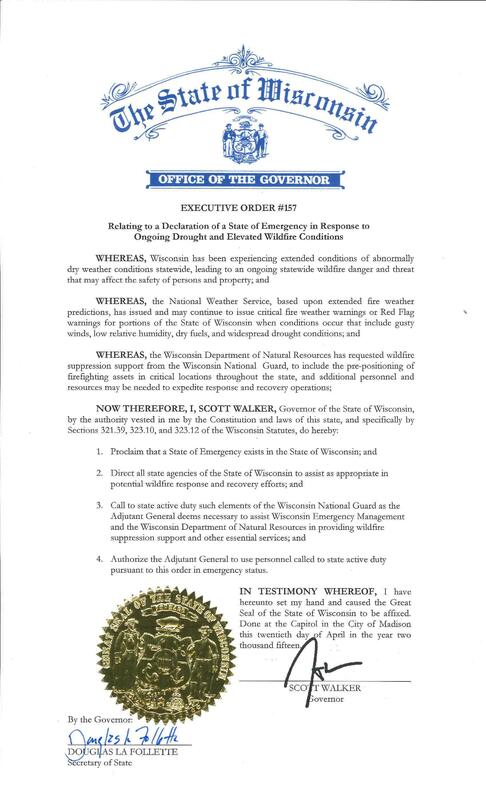 Governor Scott Walker today issued Executive Order #157, which declares a State of Emergency in Wisconsin due to an increased likelihood of wildfires as a result of abnormally dry weather conditions throughout the state. The risk of significant large fires is expected to extend at least through the end of May. In addition to calling the Wisconsin National Guard to assist in wildfire prevention and suppression, Governor Walker also asks that all state agencies be ready to aid in potential wildfire response and recovery efforts. To ensure prompt response to a potential wildfire threat, the DNR is currently monitoring weather conditions and fire behavior, and fire departments and fire suppression resources are on high-alert. 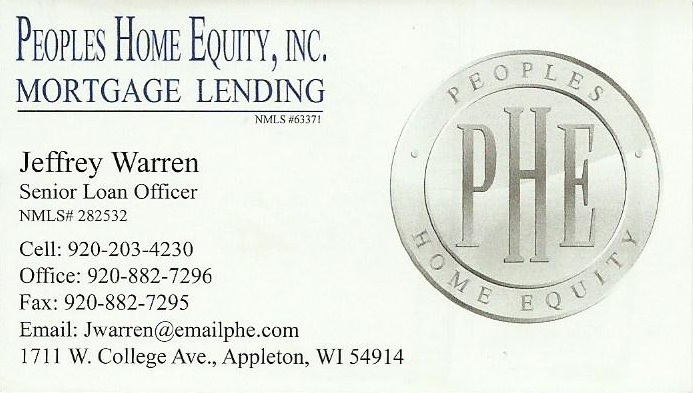 Hi, this is Scott Walker. This week, we continued our work to build a better Wisconsin by announcing two new Project SEARCH sites under our Better Bottom Line initiative. Project SEARCH is a great program that helps young adults with disabilities get the employment training and skills they need to enter the workforce. You see, when employers recognize the unique abilities of these students, it improves their bottom line. We are working to connect individuals with disabilities with the resources and the training they need to move towards greater independence and success in the workforce. Countless employers across the state are already benefiting from working with these individuals and the hard work and dedication they bring to work, which is why we invested additional funds to expand Project SEARCH in our Blueprint for Prosperity. Going forward, we are focused on continuing to improve workforce readiness for all Wisconsinites – so that everyone can enjoy the freedom and prosperity that comes from work. Gov. Scott Walker’s office announced on Friday that he will reject the plan for the Kenosha casino. The Menominee Tribe and Hard Rock International wanted to build an $800 million complex on the former Dairyland Greyhound site, but Walker remained skeptical of the potential cost for the state. On Tuesday, Jan. 20, the state and the Menominee Tribe made an agreement, or compact, that was sent off to the Bureau of Indian affairs for approval. In the compact, the Menominee Tribe agreed to compensate the state for any future money the state is required to pay the Potowatomi Tribe. But taxpayers could still be on the hook for hundreds of millions of dollars if the Potowatomi take this to court and win. “The bottom line is we’re still trying to work with all of the interested parties to get to a point where the state doesn’t lose out on something like $100 million or more because of the compacts of Jim Doyle,” Walker said previously. Both Walker, the Bureau of Indian Affairs and the Menominee could reject the compact between the state and the Menominee Tribe. 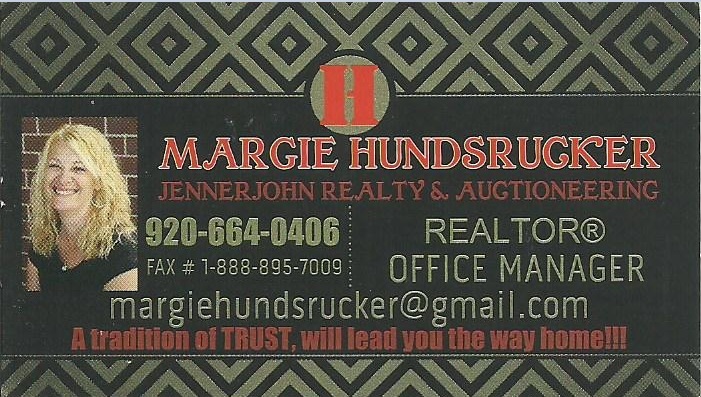 The Bureau of Indian Affairs and the Menominee have not announced their decisions. Governor Scott Walker today is making stops at Wel Companies in De Pere, and Sulzer Machine & Manufacturing, Inc. in Mosinee, to talk about the investments in workforce readiness included in the 2015-17 State Budget proposal. Some employers in high-demand fields, including manufacturing, require their employees be drug-free for safety and other reasons. To assist those looking to secure these positions, the budget includes a plan to require drug testing of those who are applying for or receiving benefits from programs, which may include unemployment insurance, FoodShare, Transform Milwaukee, transitional jobs, and others. Those who fail the drug test will be offered the opportunity to participate in a drug treatment program, free of charge, as well as job training. Technical College Tuition Freeze – Applies to those pursuing training in high-need occupations. Technical College Performance Funding – Increased to 100 percent of state aid. Financial Aid – Maintains higher education financial aid and increases funds for technical education scholarships for high school graduates who exceed in career and technical education courses. Transform Milwaukee Jobs Program – Invests $5 million annually, and extends to high-need rural areas of the state, including Racine and Kenosha, at $3 million over the biennium. Wisconsin Fast Forward – Continues investments at $7.5 million annually, as well as maintaining increased funding for apprenticeships and to help people with disabilities who want to transition to the workforce. Career Planning – Continues funding for academic and career planning for schools, so children can prepare higher education and a career. Wisconsin Works – Reduces time spent on Wisconsin Works from 60 months to 48, to encourage more rapid placement in jobs. Teacher Licensure – Creates alternative pathways to allow a candidate with real life experience to pass a competency test to gain a teacher license. Veterans Employment – Consolidates initiatives in the veterans’ agency to elevate them and improve their focus, waives CDL fees for veterans, adds credit for prior learning for veterans with military training to the performance measures used to aid technical colleges. Victory Spark program – Invests $500,000 to maintain program, a business accelerator for veterans that has resulted in 39 startups and 150 new jobs. Sixteen technical colleges received almost $28 million to reduce wait lists, and opened up availability for almost 5,000 students to get training for high-demand fields. Collaborative projects among high schools, technical colleges, businesses, and others are increasing opportunities that result in industry-recognized certifications for high school pupils. DWD announced in May intent to award 30 grants for up to 949 high school pupils and could involve employment at up to 153 employers. Under Governor Walker’s Better Bottom Line initiative, which helps people with disabilities enter the workforce, DWD eliminated a waiting list for people with significant disabilities seeking assistance to achieve independence and self-sufficiency through employment. 4,415 individuals with disabilities successfully reached their employment goal and entered the workforce, the highest level in 15 years. Project SEARCH program, which helps high school students with disabilities transition into employment is expanding from seven Wisconsin sites to 27. In 2014, DWD announced approximately $12.5 million in Wisconsin Fast Forward grants to equip almost 13,800 current and new workers with the high-demand skills since the program began in 2013. DWD has also awarded funding of approximately $2.1 million in grants for school‐to‐work programs across the state to train up to 949 high school pupils. Following investments in Youth Apprenticeship (YA), enrollment for the 2013-14 school year reached 2,469, a 10 year high for the YA program. DWD’s Office of Veterans Service (OVS) was in the top ten states nationally with a 65 percent Entered Employment Rate for Veterans served by OVS. Wisconsin was tied for 2nd place nationally with an Employment Retention Rate of 83 percent. After inheriting a UI Trust Fund deficit of $1.4 billion, the Trust Fund now has a positive balance this year following the enactment of historic reforms by the Governor Walker and the Legislature. New Transitional Jobs Program helps low-income and low-skilled workers transition to employment, providing immediate income and work opportunities. Expanded WAT grant program allows more employers to participate. As of this week, there are nearly 70,000 open positions posted on the Job Center of Wisconsin website (https://jobcenterofwisconsin.com/. Over the next eight years until 2022, it is estimated that there will be 760,200 job openings and replacement positions that need to be filled in Wisconsin.